Modi was quick to express gratitude for the award and took to Twitter to praise President Vladimir Putin. New Delhi: After United Arab Emirates, Russia on Friday has become the second country to announce a national award for Prime Minister Narendra Modi during the ongoing election campaign. A Kremlin press release noted that the Russian president Vladimir Putin signed an executive order conferring the “the Order of St Andrew the Apostle the First-Called” on Modi. 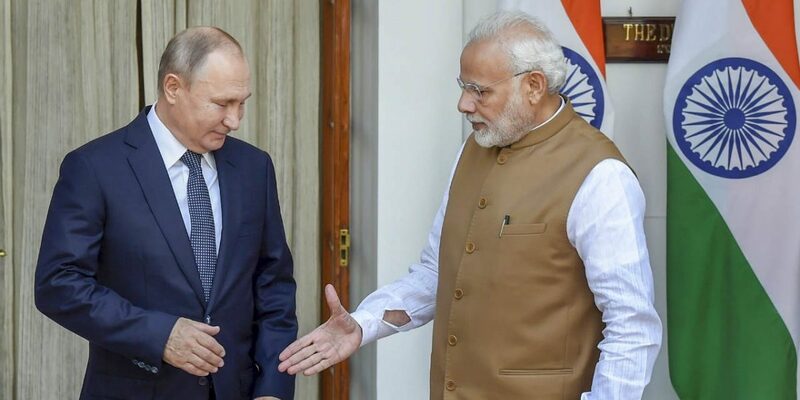 The highest Russian national order was presented to Modi for “his distinguished contribution to the development of a privileged strategic partnership between Russia and India and friendly ties between the Russian and Indian peoples”, as per the Russian release. On April 4, the UAE had also announced that Modi had been chosen for the Order of Zayed, the highest decoration medal for foreign leaders. India’s election commission announced the schedule for Lok Sabha elections on March 10, which marked the start of the imposition of the model code of conduct. It is still not clear when Modi will collect these awards. Russia has earlier invited the next Indian prime minster to attend the Eastern Economic Forum in Vladivostok in September 2017. Modi was quick to express gratitude for the award and praised President Putin. “President Putin remains a source of great strength for the India-Russia friendship. Under his visionary leadership, bilateral and multilateral cooperation between our nations has scaled new heights,” he tweeted. External affairs minister Sushma Swaraj also issued a celebratory tweet to point out that Modi has received several international awards. According to a MEA press release, the award has been conferred to 18 “distinguished personalities” since 1998. The foreign leaders who have received this award include Chinese President Xi Jinping, Kazakhstan President Nursultan Nazarbayev and President of Azerbaijan Heydar Aliyev. During the initial years of the Modi government, Moscow had largely felt that New Delhi had moved more closer to an US embrace. The relationship with Russia is largely uni-dimensional, with defence being the focus of ties. Economic relations have largely lagged behind, even despite both capitals having repeatedly underline the need to broad-base the relationship. Also read: Modi Wins ‘First-Ever’ Philip Kotler Presidential Award – But What Is it? The informal Sochi summit in May 2018 was supposed to bridge the trust deficit and improve the chemistry at the leadership level. India announced in October that it had finalised S-400 missile system, despite threat of sanctions under the Countering Americas Adversaries Through Sanctions Act (CAATSA). New Delhi has usually backed Moscow’s position on key political issues like Crimea and Syria. However, both sides had diverged in Afghanistan, where India has been concerned at increasing Russian and Pakistani closeness with Moscow keen to bring the Taliban to the table to accelerate the withdrawal of US troops.